Remember this hand hewn frame, made of pine timbers, that we highlighted in last week’s blog? Well – the good news is – restoration is complete! After 8 days of focused work with a superb team of seven, the barn is fully restored and in use. At 21 feet wide x 30 feet long, it spent nearly 175 years protecting hay in a meadow in Benson, Vermont. 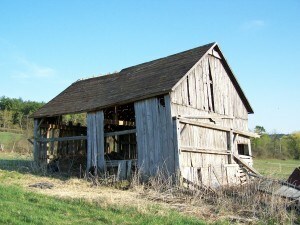 This barn has had quite a journey since 1840. 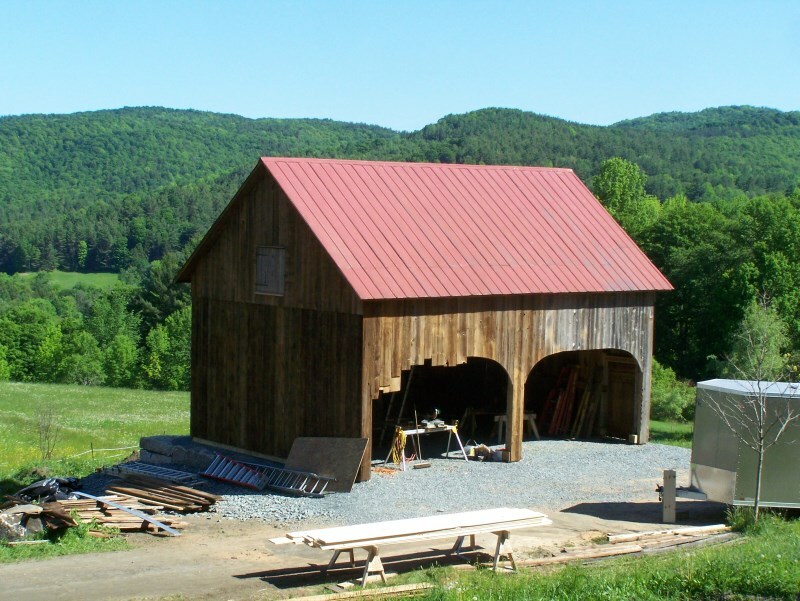 We became involved a few years ago when we took down the barn, restored the structure and erected it at our workshop. It was put to good use there, protecting building materials, while we waited for a new owner; and in time the right family came along. We’ve spent the past two weeks restoring the frame for the new owners in Pomfret, VT. 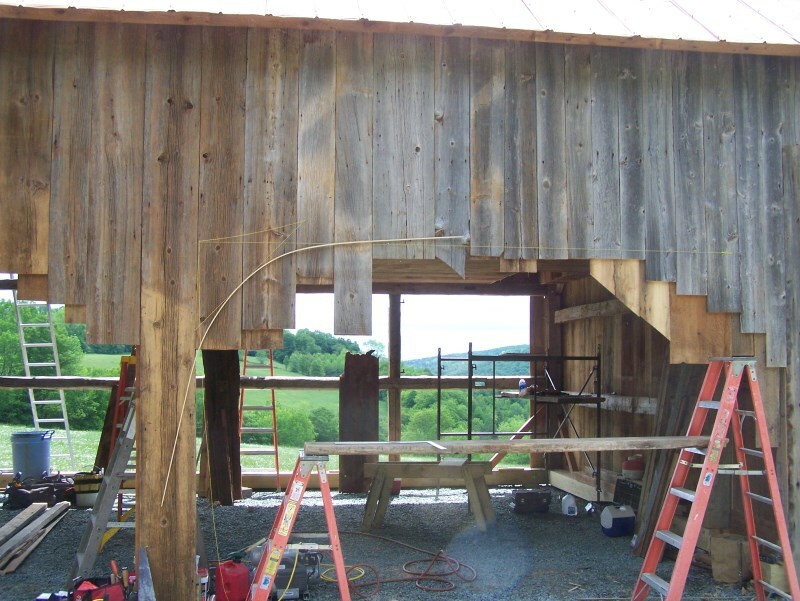 In last week’s blog, I wrote about the process of dismantling and re-erecting the antique timber frame in Pomfret. 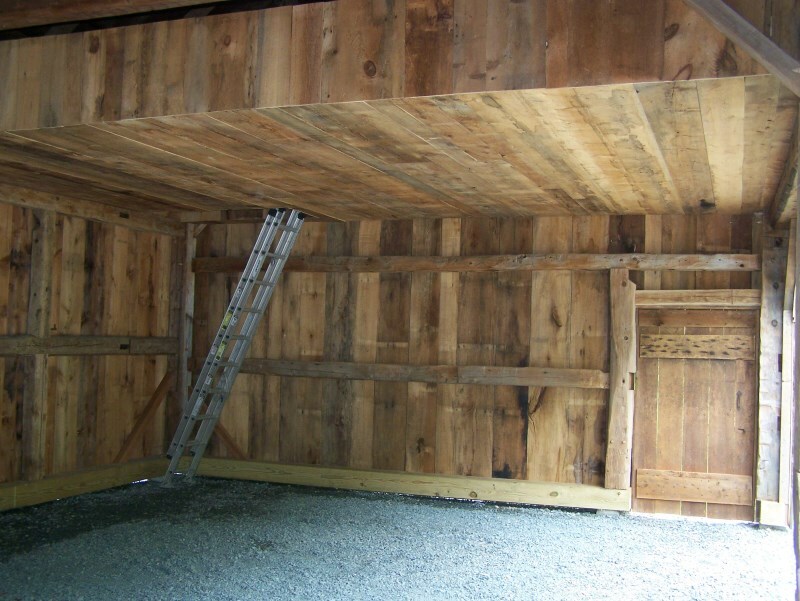 I also showed how we applied the roof boards and started on the siding, using materials from another historical barn. Last week, we put on two layers of siding, one ½ an inch thick and the second one 1 inch thick. We put the two layers on, overlapping each other, to keep the driving rain and snow from seeping through the cracks. As always – we love to recycle! 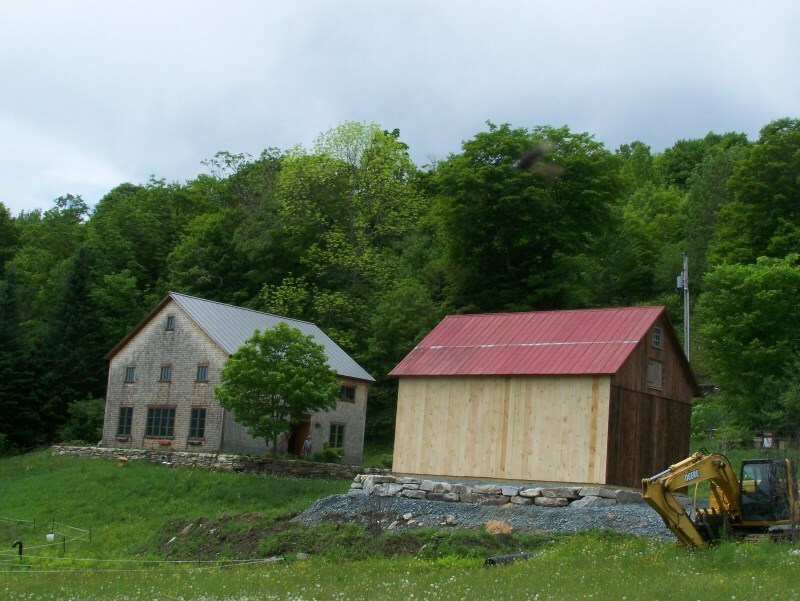 For this project, we used exterior siding from four different barns and the door is also on its second life. You can see the original barns here on our available frames page. 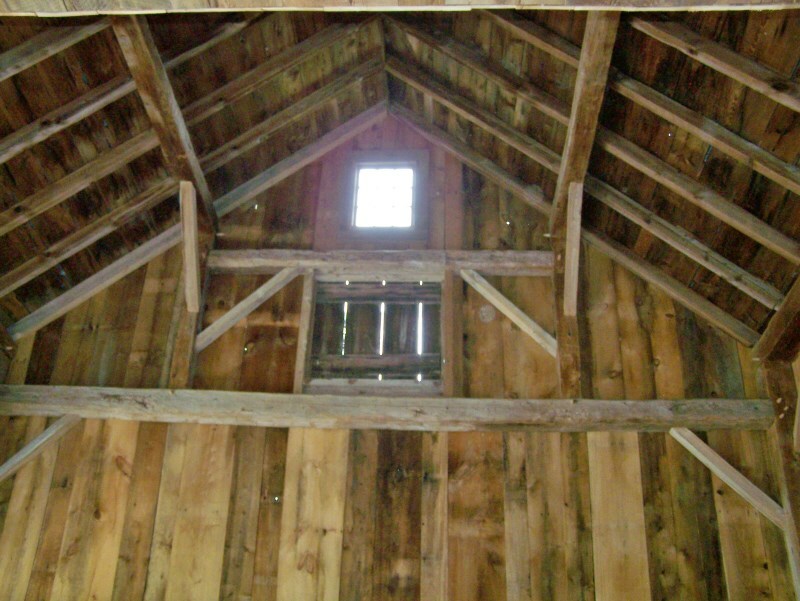 In the view above, you can see the recycled red roof taken from another barn project we also have in progress. Economics and availability often come into play with a project, as reclaimed siding can be four times more expensive than new. 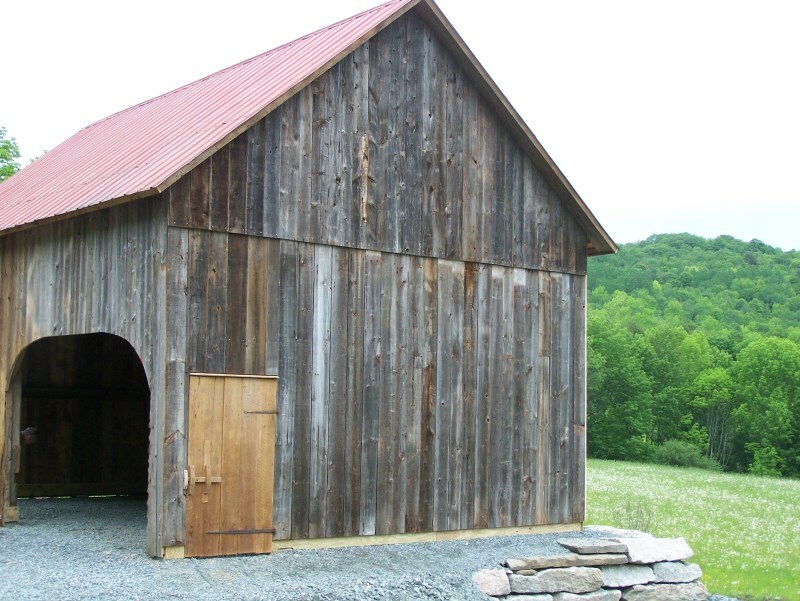 In this case, the owners chose to use new siding on the back side of their barn. It is hidden safely from view and can not be seen from the house or the road. Give it another thirty years and it will look vintage, too. 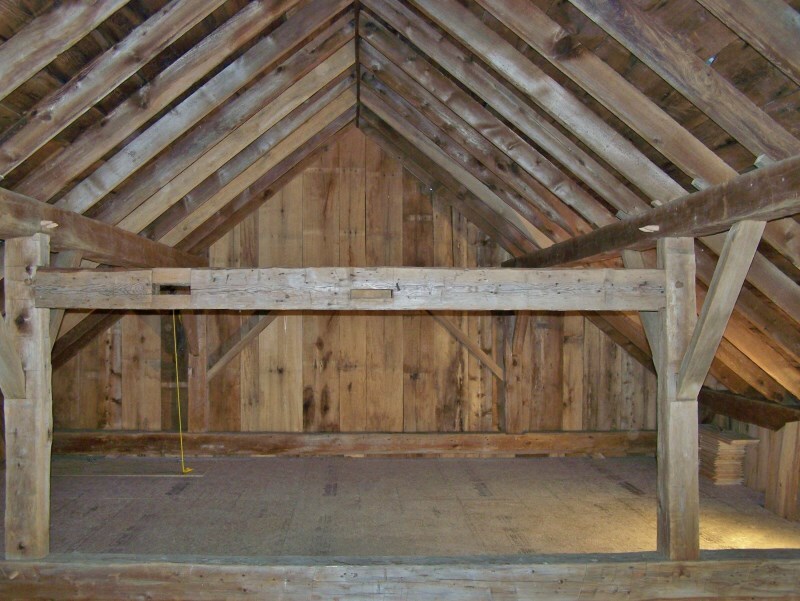 From the interior of the barn, we can see the beautiful hand hewn timbers of the original frame. 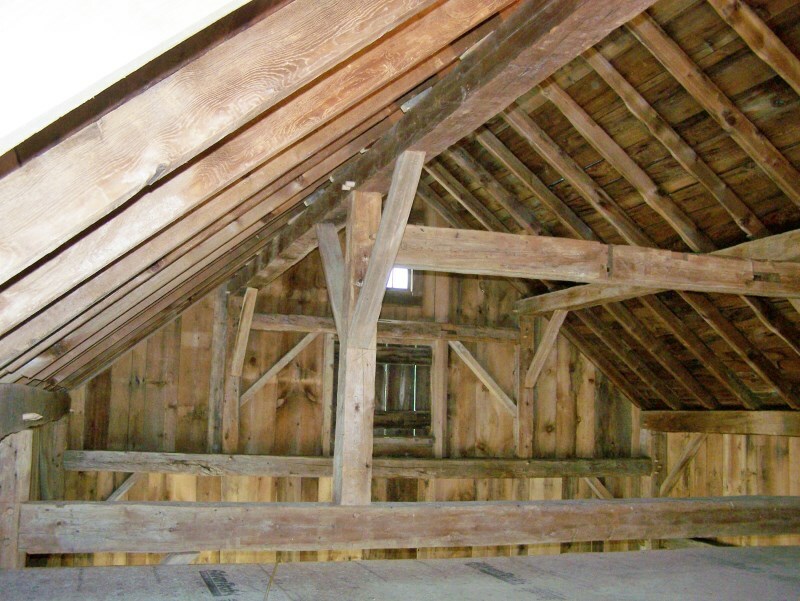 The upper loft might make a wonderful overflow guest room in the summertime. There’s a large, open main level with the relatively spacious half loft. Eventually, a modest stairway will replace the metal ladder that you see in the view below. 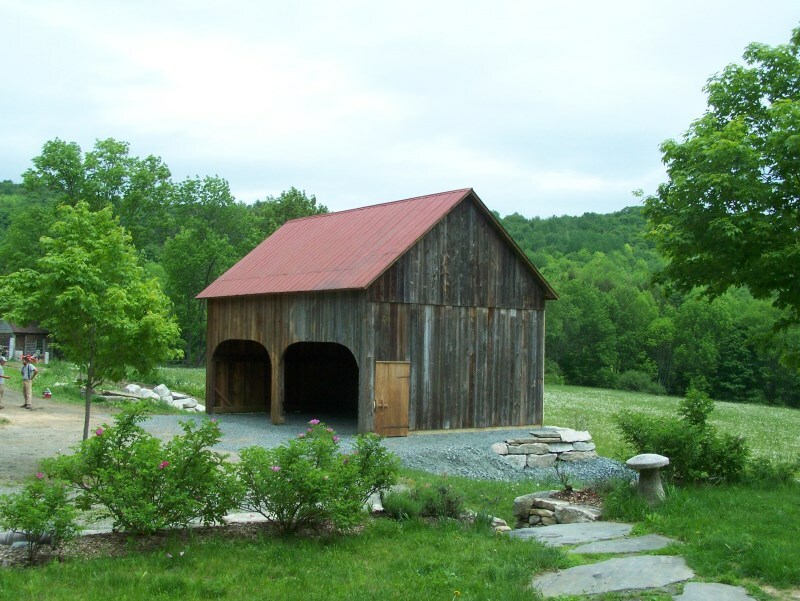 It was, as always, a pleasure to save another barn – and create a new-old barn for another wonderful client. The point was to have it look like it has been there for one hundred years. Did we succeed? 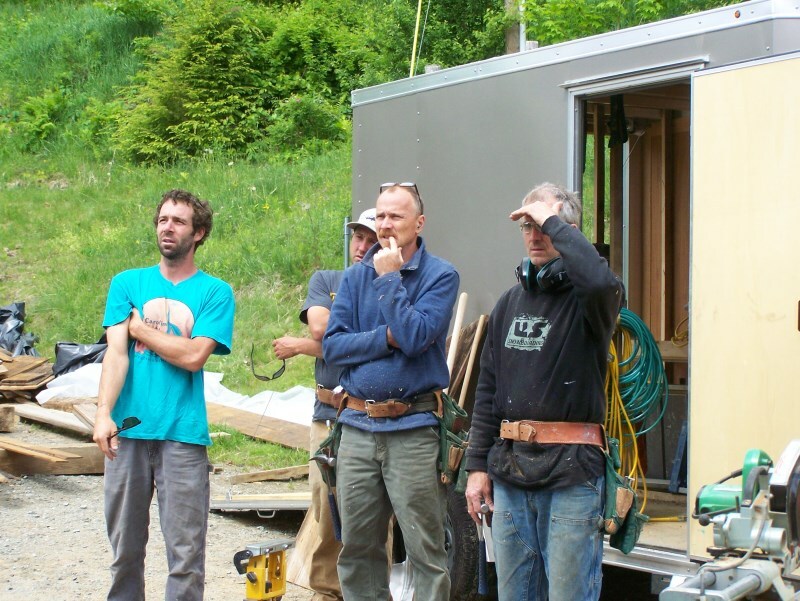 This year has been a busy one here at Green Mountain Timber Frames. We’ve dismantled no fewer than seven barns and houses in the last year and they are each in various stages of restoration. Want your very own piece of American history? 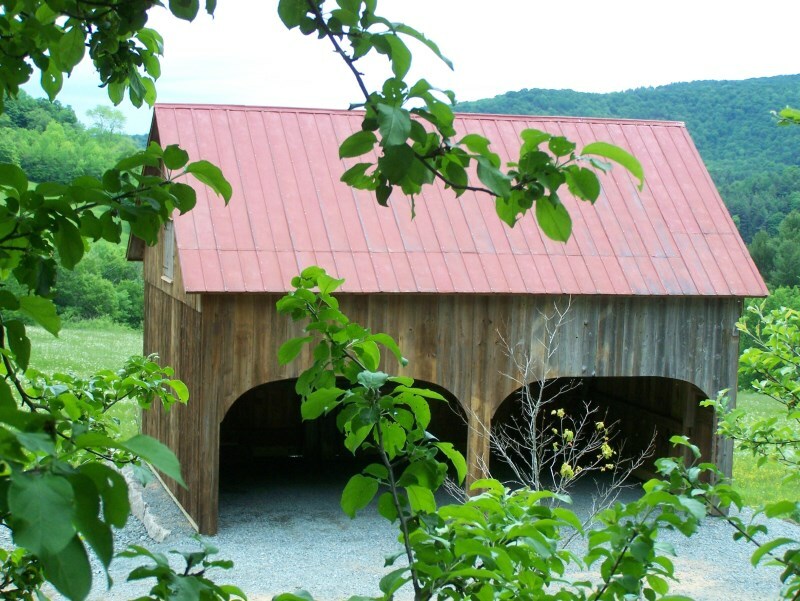 Think that barn living might be for you? Give me a call at 802.774.8972 or email Luke@greenmountaintimberframes.com. 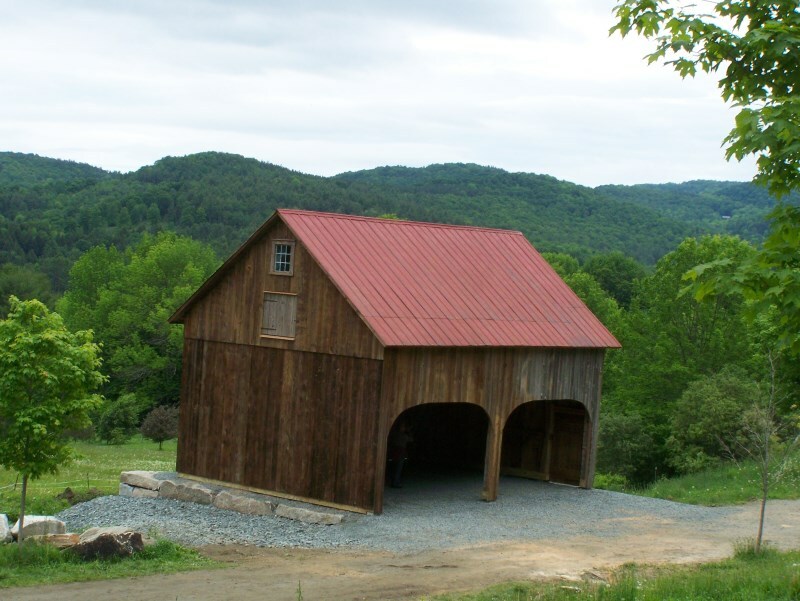 This entry was posted in Green Mountain Timber Frames, Post and Beam, Sold Timber Frame Homes, Timber Frame Projects and tagged American Architecture, American History, available barn frames, barn restoration, historic barn, historic New England, New York Timber Frames, restored wood, timber frame, timber frame projects by Green Mountain Timber Frames. Bookmark the permalink.